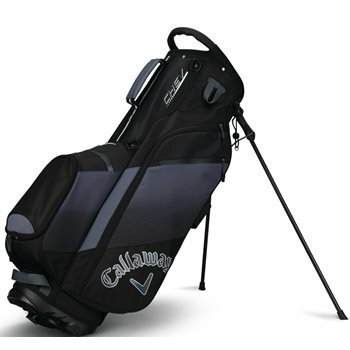 The Callaway Chev stand bag features 6 pockets for storing golf essentials and personal items and a 5-way top with full length dividers. The full length dividers offer club protection and the pockets are designed for maximum storage and easy access. Featured pockets include a Velour-lined valuables pocket, a full-length apparel pocket and a seamless tee pocket. The lightweight Chev stand bag is designed with modern graphic print for a stylish look, an easy grab handle for lifting, and a bottom ball pocket for logo customization.